Corian and quartz solid surfaces are two very popular types of kitchen countertops. Corian is the name of a solid surface countertop brand created by DuPont. This type of countertop is made from an acrylic polymer and natural mineral blend and is primarily composed of Alumina Trihydrate. It mimics the appearance of stone but has some distinct properties that makes it a great countertop choice. Quartz countertops are also man-made and are composed of a mixture of mostly ground quartz and various resins, polymers, and pigments. The result is a granite-like surface that has either a flecked or smooth appearance. 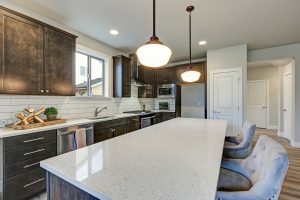 If you aren’t sure whether to go with Corian or quartz solid surfaces, here are the pros and cons of both to help you decide which type of countertop is best for you. Corian is nonporous which results is a surface that is stain and bacteria resistant. It is very hygienic and super easy to clean. It is extremely easy to repair if damage occurs and is more durable than laminate countertops. Corian is a very attractive choice due to its seamless appearance and variety in colors and designs. Corian is not the most durable countertop surface out there and is prone to scratches and heat damage. Corian typically does not have the glossy appearance or feel that some people prefer. Although Corian is more affordable than quartz, some consider Corian to be too expensive since there are certainly cheaper choices on the market. Quartz is also nonporous and has a beautiful, shiny appearance. Quartz looks and feels a lot like stone and is more durable than Corian. Quartz is more affordable than completely natural countertops, like granite, and has a low impact on the environment. Quartz is an expensive countertop option. It does not have the same seamless appearance as Corian and is not as easy to repair.